Belmont Park stakes winner Doctor Chit (TB) has joined Royal Vista Ranches 2015 stallion roster. WAYNE, OK�NOVEMBER 24, 2014�Royal Vista Ranches, near Wayne, Oklahoma, announced today that Belmont Park stakes winner DOCTOR CHIT (TB) will join their stallion roster for 2015. His fee has been set at $2,500, live foal. His first foals arrive in 2015. Owned by Dream Walkin' Farms, Doctor Chit won or placed in five of eight career start while earning $196,610. He won the Western Larla Stakes and was second in the Grade 2 Amsterdam Stakes. He was also a finalist in the Foxwood's King Bishop Stakes(G1) and Stoll Keenon Ogden Phoenix Stakes(G3). The bay stallion flashed tremendous talent as a sprinter while running six furlongs in :1:08.90 at Belmont Park. His sire War Front (TB), who stands for a fee of $150,000, is among the leading Thoroughbred sires. A Grade 2 winner of $424,205, from five crops to race War Front (TB) has sired 32 stakes winner with earnings of $25.7 million. His top performers include Declaration Of War (TB) (hwt. 4 times in Europe, England and Ireland, $1,847,489 USA, Juddmonte International S. [G1], etc. ), Lines Of Battle (TB) (hwt. in United Arab Emirates, $1,363,926 USA, Saeed & Mohammed Al Naboodah Group U.A.E. Derby [G2], etc. ), Departing (TB) (to 4, 2014, $1,588,169, West Virginia Derby [G2] (MNR, $451,500), etc. ), Warning Flag (TB) ($1,404,437 USA, Mercedes-Benz Hong Kong Classic Mile, etc.). Doctor Chit is out of a stakes producing Yes It's True (TB) mare who is from the family of stakes winners Mr. Greeley (TB) ($474,452, Lafayette S. [G3], etc., TB and QH Sire), Majestic Legend (TB) ($200,853, Week of Fame Ladies H. [L] (FG, $60,000), etc. ), and stakes-placed Talltalelady (TB) ($208,968, 2nd Alcibiades S. [G2], etc. 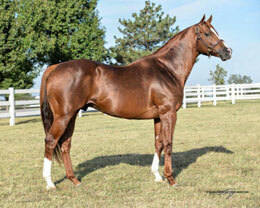 ), Warfield (TB) ($65,125, 3rd Oceanside S.-R (DMR, $9,000), TB Sire), etc. Doctor Chit will be joining Dream Walkin' Farms stakes winning son of Hennessy (TB), SEBASTIAN COUNTY (TB), who stood at Royal Vista Ranches last season. He entered stud in 2012 and his first crop will be 2-year-olds in 2015. SEBASTIAN COUNTY (TB) won or placed in 15 of 25 career starts while earning $230,155. He won the Northern Spur Stakes at Oaklawn and was 2nd in the Prairie Meadows H., Jim Rasmussen Memorial Stakes, and third in the Grade 3 Arlington-Washington Futurity, Mountain Valley Stakes, Robert F. Carey Memorial Handicap, and Bosselman/Gus Fonner Stakes-twice. SEBASTIAN COUNTY (TB)'s sire is the Grade 1 winner Hennessy (TB), earner of $580,400 and the sire of 5 Champions, and earners of more than $77.6 million. His top Thoroughbred performers include Grand Armee (TB) (champion in Australia, $3,780,167 USA, Doncaster H. [G1], etc. ), Inglorious (TB) (champion in Canada, $1,421,222 USA, Queen's Plate S.-R (WO, $600,000(CAN)), etc. ), Special Duty (GB) (TB) (European Champion, $1,070,938 USA, Stanjames.com One Thousand Guineas [G1], etc. 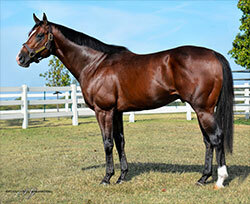 ), Johannesburg (TB) (european Champion, $1,014,585 USA, Breeders' Cup Juvenile [G1], etc. ), Perfect Storm (TB) (champion in Turkey, Tay Deneme, etc. ), Sunrise Bacchus (TB) ($3,649,174 USA, February S. [G1], etc.). Hennessy (TB )'s top Quarter Horse performers include multiple G1 winner Check Him Out SI 98 ($418,528, Ed Burke Memorial Futurity-G1, etc. ), Masters Call SI 102 ($106,757, Los Alamitos Two Million Juvenile Invitational., etc. ), etc. Sebastian County is out of the stakes-placed Lycius (TB) mare Double Park (FR-$57,392). She is the dam of 6 winners including Arlington-Washington Futurity(G3) winner Cactus Ridge (TB-$187,850, a full sibling to Sebastian County), La Habara Stakes winner Harriett Lane (TB-$163,500), etc. She is the granddam of stakes winner Heiko (TB-$166,521 to 5, 2014) and stakes-placed Street Of Gold (TB-$148,383 to 4, 2014), etc. For additional information or breeding contracts to DOCTOR CHIT (TB) or SEBASTIAN COUNTY (TB) call Laura Erickson, Farm Manager, at 405-449-7575.